Men with deep voices tend to have more children than those who speak at a higher pitch, scientists say. Their finding is based on a group of hunter-gatherers in Tanzania known as the Hadza, who can be studied without bias because they use no birth control. Males who hit lower notes as they talked had about two more children on average than squeaky speakers. It fits with observations that women find masculine voices more attractive, the team reports in Biology Letters. "There are a lot of reasons why lower pitch and reproductive success could be linked," said Coren Apicella, from the Department of Anthropology in the Faculty of Arts and Sciences at Harvard University, US. Deep tones are suggestive of increased testosterone levels, which could lead females to perceive such men as better hunters and therefore better providers, she told the BBC. "Or it could be that men with deeper voices simply start reproducing earlier. We really don't know what is behind this yet." Apicella's group studied the Hadza because "they provide a window into our past" - they live their lives much as our ancestors did, and their behaviours could illustrate key facets of evolution that might otherwise be swamped by modern culture. 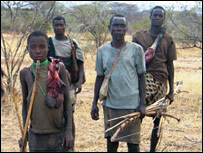 Hadza females gather berries and dig for tubers, while the males hunt animals and collect honey. Marriages are not arranged, so that men and women choose their own spouses. The Hadza are monogamous, but extra-marital affairs are common, and the divorce rate is high. For the study, voice recordings were collected from 49 men and 52 women between the ages of 18 and 55. "The experiment was really simple," said Ms Apicella. "I went to nine different camps and I'd just get them to come into my Land Rover and record them saying the word 'hujambo', which means 'hello', into a microphone. "I then analysed the voice and pitch, and compared it with the person's reproductive history - how many children they had had and how many were still surviving." The results indicated the deeper the man's voice, the more likely he was to have fathered more children, she said. She added that voice pitch was not linked to child mortality. "We found that for women, the voice pitch was not connected to reproduction." Because of the similarity which their hunter-gatherer lifestyle bears to that of our ancestors, the reproductive success of the Hadza could be indicative of the way that human beings evolved. If females are drawn to deeper voices, this would drive selection in the population towards that trait. In other words, lower-pitched male speakers would become dominant over time. "It's possible that vocal dimorphism has evolved over thousands of years, partly due to mate selection," explained Ms Apicella. "Perhaps at one time, men and women's voices were closer in pitch than they are today." Her group has plans to extend its study. It is analysing data gathered from an experiment designed to test whether lower voice pitch in Hadza men really is any kind of indicator of performance. "I set up the 'Hadza Olympics'," she said. "The tribesmen participated in lots of activities, like archery competitions, racing, hunting, etc. "I'm going to look now at these to see if there is a link between hunting success, reproductive performance and voice pitch." The research was undertaken with David Feinberg of McMaster University and Frank Marlowe of Florida State University.